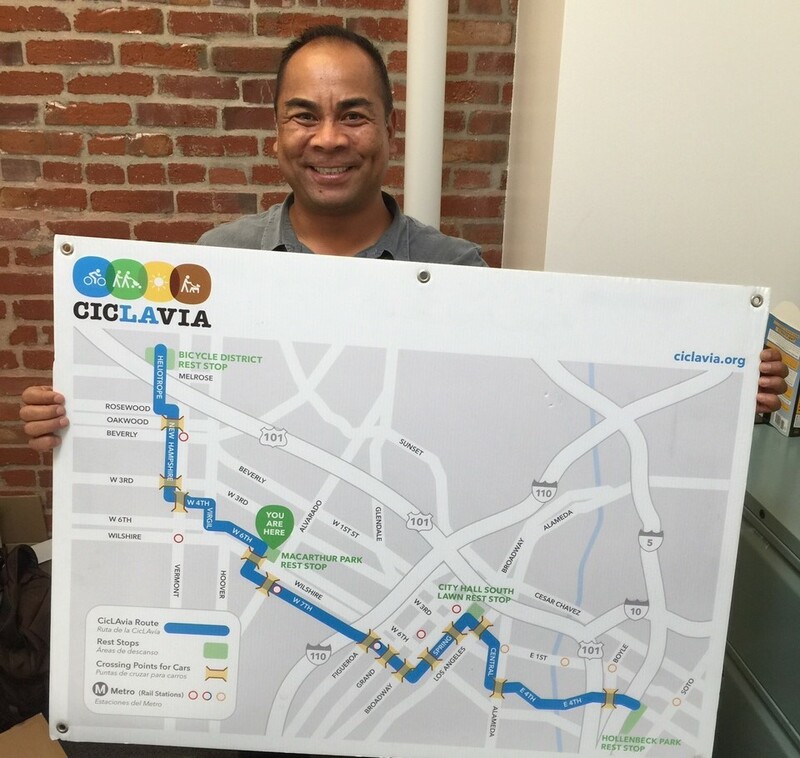 CicLAvia Executive Director Romel Pascual holds up the map from the first CicLAvia on October 10, 2010. Photo: Joe Linton/Streetsblog L.A.
Romel Pascual is the Executive Director of CicLAvia. If you’re reading Streetsblog L.A., you probably know that the non-profit CicLAvia collaborates with cities to host open streets events throughout Southern California. Pascual and his crew are gearing up for the next CicLAvia event, their Iconic Wilshire Boulevard route, coming up on Sunday August 14. The interview took place at CicLAvia’s office earlier this week. SBLA: Tell us about your background – how did you come to this job? Romel Pascual: I came to this job via public sector work that I’ve done. I served as a Deputy Mayor of L.A. focused on Energy and Environment for many years. One of the things that we were thinking about then was how do we do a thing like this? This was at a time when L.A. never knew how to close a street. What would it look like? When we said yes, it was an experiment. It was one of the best experiments that L.A. had done. Now I find it’s hard to think of L.A. without a CicLAvia. Tell us a bit more about your background – where did you grow up? I grew up in Southern California, in Long Beach – on the west side of Long Beach. Then moved out to Downey and then went to UCLA. I lived on the Westside for years. Then I went to Grad School in Berkeley. I was there for 12 years before coming back home in 2005. That’s when I joined the city of L.A. Early on, my best memories of L.A. were when I had a newspaper bike route for the Southeast Newspaper. A lot of us have those memories – being chased by a small dog, as a 12-year-old boy, you pedal as fast as you can. Bicycling around, I knew that the places we lived were really not that far apart from each other. The bike made everything so much closer. Of course, at the time, I made $5 a week which was great to go and buy candy. What’s coming up for CicLAvia. How about the Wilshire event in August? What’s after that? We’ve been doing CicLAvia four to five times a year. Mostly every two or three months, there is a CicLAvia coming up, which is great. We have one on August 14 which is going to be on the iconic Wilshire Boulevard, from Grand to Western. It’s downtown to K-town. The theme for this particular CicLAvia is really about stories. When you think about Wilshire and you sit for a moment, you look around you see the historic-ness of the boulevard, you can imagine the stories one can tell. About Wilshire. And also the stories one can tell about CicLAvia. There’re so many stories one can tell over the course of the 17 CicLAvia events that we’ve had. Wilshire will be 18, so we’re getting into the adult phase, if you will. We can tell stories from the first time – 10-10-10 – to now. There’re probably hundreds of thousands of stories. On this route, we want to share many of those stories with people. Then you’re also going to see CicLAvia in October at our iconic Heart of L.A. route, the first route that we did on 10-10-10. We also want to also move around, to get to different parts of the city and the region, including places like Glendale – Atwater Village to Glendale. Maybe looking at San Pedro and Wilmington – get further south. Then also get further north, we look to the Valley. The Valley is an amazing place. We’ve been to the Valley twice. Then look east and west as well. Places we haven’t been. So many communities that make up this great region and certainly this great city. We want to hit as many of those as possible. If you had a magic wand and overnight you could change one thing about our streets, our city, livability – what would be it be? I mentioned it a little bit earlier. It’s about the joy of being on a bike and the joy of walking around your city. You feel it more when you’re a kid, things look so far away and feel so far away, but when you’re on a bike, and you move around and things become closer. If there were something that I would change, it would be that people would wake up one day and realize that places are much closer to each other than we think. Drivers travelling on these freeways are stuck in traffic. If we’re on a bike, we realize that communities are literally 20 minutes away from one and other. I just hope that, one day, people realize that you can take a bike and everything becomes much closer. I hope that people will actually believe how close we all are. If I could have a second wish, while I am at it, I would want to wake up one day to find that the entire length of the L.A. River would have a continuous walk and bike path.